The black sleeve creates sharp contrast. To create this contrast and illustrate the cloth texture you can use completely different approach to the face and hands. Compare with smooth hands, the sleeve has deep black color with velvety texture. For this task the variety of soft pencils is suited best. You can go for hardness from B2 to B6. Unlike in previous examples there is no need of doing preparation layer with hard pencil. Go straight ahead with a soft one. 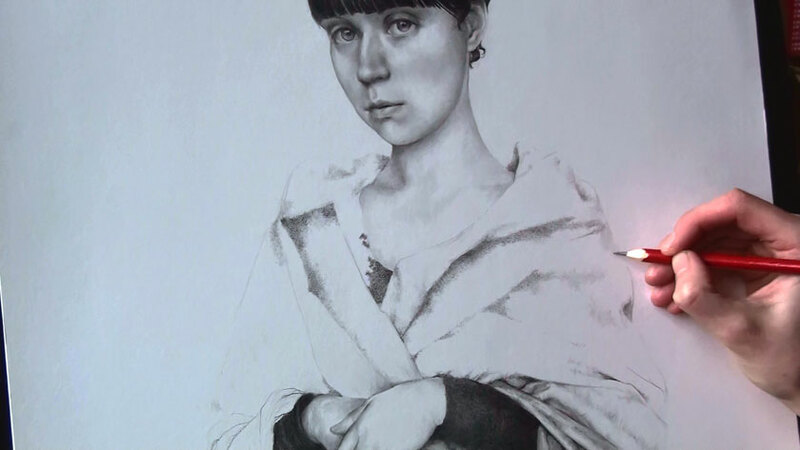 Using the same soft pencils you can touch here and there all the darkest places, tonal depth of the hands. Than just do general cosmetic form improvements. 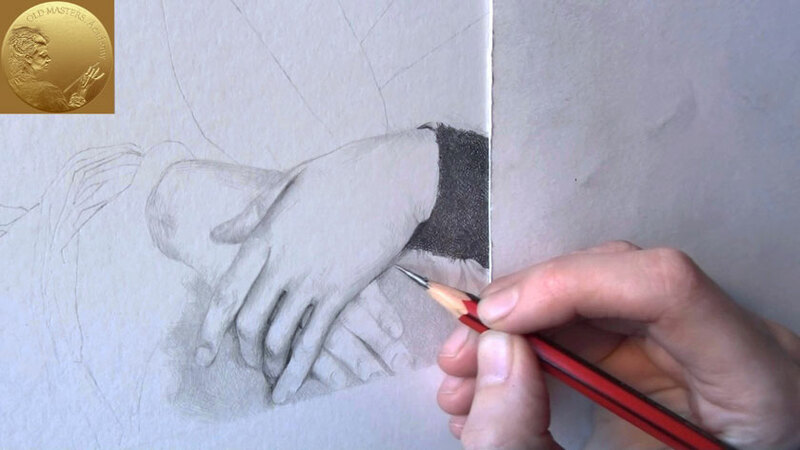 Continuing with black sleeves – the pencil tips must be accurately sharpened. Soft graphite is fragile and can easily break. Don’t worry; with right pressure you will get all remarkable benefits of working with such tool. Also, don’t be afraid of ‘wasting’ graphite while sharpening – a blunt pencil is the false economy! To achieve the best result in filling in the area of the sleeve do following: to control the consistency of the strokes do short dynamic strokes, from 3 to 5 in a row. And overlap the row with next row in different direction. And so on as you see on the video. It is time consuming process, be patient. The quality and patience are key factors in big masters’ works. There is no reason to rush. Do not work too long without giving your eye a little rest; a few moments will be quite sufficient. If things won’t come, stop a minute; the eye often gets fatigued very quickly and refuses to see truly, but soon revives if rested a minute or two. Do not go laboring at a drawing when your mind is not working; you are not doing any good, and probably are spoiling any good you have already done. Pull yourself together, and ask what it is you are trying to express, and having got this idea firmly fixed in your mind, go for your drawing with the determination that it shall express it. The best idea is to leave your work for a day or two, and don’t touch it for a while, don’t even look at it for self judgement or to analyse the work in progress. After having a good rest from the drawing you can attentively approach to the drawing. The brake is essential to look at your work with new, fresh eye. You would see all places on your work which is not perfect and deal with them would be easier.